An international team of scientists has recently developed a novel technique that allows direct and complete imaging of microwave magnetic fields with high spatial resolution. The new method has great implications, since it could optimize the performance of electronic devices. Microwaves are found in numerous devices; mainly, because they are an essential part of modern communication technology. For example, mobile phones and laptops are equipped with integrated microwave circuits for wireless communication. To develop such circuits and improve their performance, sophisticated techniques are required. Now, scientists at the Max Planck Institute of Quantum Optics, the LMU Munich, and the University of Basel have demonstrated a new technique for the imaging of microwave magnetic fields. In their paper, recently published in Applied Physics Letters, they describe using small clouds of ultra-cold atoms. In their experiment, the researchers laser-cooled atoms to a temperature of a few millionths of a degree above absolute zero; at these ultra-low temperatures, the atoms obey the laws of quantum physics, having a quantum state that is very sensitive to externally applied electromagnetic fields. 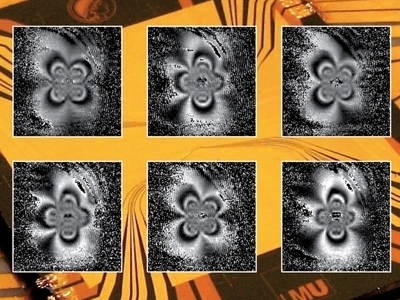 Thus, these “cooled” atoms make the ideal sensors, as their behavior can be measured precisely. For the measurement, the atoms are positioned at the desired location above the microwave circuit with the help of static magnetic fields, and subsequently the microwave field is turned on. “The internal state of the atoms changes if a microwave field is applied,“ said Pascal Böhi explains, who co-developed the technique as part of this doctoral thesis. The new technique varies greatly from traditional methods, mainly due to its higher rates of accuracy. When designing circuitry, engineers use computer simulations. Because of the large number of components in modern integrated circuits, such simulations have to rely on approximations – derived from the common methods’ lack of accuracy – and thus result in unreliable products. Efficient testing requires measuring all components of the microwave field directly and with very high spatial resolution. In existing techniques for measuring microwave fields, the field distribution has to be scanned point-by-point, making that kind of data acquisition a slow process. Moreover, most techniques only allow for a measurement of the amplitudes, but not of the phases of the microwave field; and because macroscopic probe heads used for the measurement can distort the microwave field, results are usually in poor spatial resolution. Unlike prevalent methods, the new technique does not require the microwave field to be scanned point-by-point. Rather, a fully two-dimensional image of one component of the microwave field can be recorded in a single shot. This increases the data acquisition rate dramatically. In addition, the technique allows not only for a reconstruction of the amplitudes, but also of the phases of the microwave field components. As the atoms are truly microscopic objects, they do not distort the microwave circuit to be characterized, in contrast to macroscopic probe heads. The new method works for various frequencies in the gigahertz range, giving scientists the option to apply it using various devices. “We can image this change of internal state with a CCD camera with high spatial resolution. The stronger the microwave field at a given position, the faster the rate of change we observe,” Böhi said. “We have successfully demonstrated the new technique in our lab,” said Philipp Treutlein, the leader of the project. “Quite naturally, further development is necessary before it could be used in commercial applications.” Due to the existing potential, the team of researchers has already submitted a patent application describing the new technique. A related TFOT story is that of the source of cosmic microwave backgrounds, which is also researched at the Max Planck Institute. For more information about imaging microwave fields using cold atoms, see the official press release, published by the Max Planck Institute of Quantum Optics.